to the information page specific to the 74th Regiment from 1787 to 1881. Please use the side navagation for more. A History of the 74th Regiment 1787 to 1840. 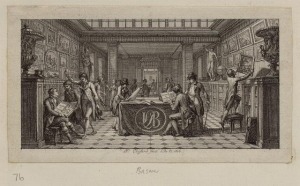 Below is an intoduction to the history of the regiment starting in the late 18th Century. I Colonel and Captain. 1 Adjutant. 1 Lieutenant-Colonel and 1 Quartermaster. Captain. 1 Surgeon. 1 Major and Captain. 2 Surgeon’s Mates. 7 Captains. 80 Sergeants. 1 Captain-Lieutenant. 40 Corporals. 21 Lieutenants. 20 Drummers. 8 Ensigns. 2 Fifers, and 1 Chaplain. 710 Privates. A recruiting company was afterwards added, which consisted of— 1 Captain. 8 Corporals. 2 Lieutenants. 4 Drummers. 1 Ensign. 80 Privates. 8 Sergeants. Total of Officers and Men of all ranks, 902. The regiment was styled "The 74th Highland Regiment of Foot." 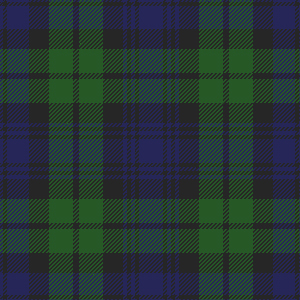 The uniform was the full Highland garb of kilt and feathered bonnet, the tartan being similar to that of the 42nd regiment, and the facings white; the use of the kilt was, however, discontinued in the East Indies, as being unsuited to the climate. The following were the officers first appointed to the regiment:— Colonel—Archibald Campbell, K.B. Lieutenant-Colonel—Gordon Forbes. Captains. Dugald Campbell. William Wallace. Alexander Campbell. Robert Wood. Archibald Campbell. Captain-Lieutenant and Captain—Heneage Twysden. Lieutenants. James Clark. John Alexander. Charles Campbell. Samuel Swinton. John Campbell. John Campbell. Thomas Carnie. Charles Campbell. W. Coningsby Davies. George Henry Vansittart Dugald Lamont. Archibald Campbell. Ensigns John Forbes. John Wallace. Alexander Stewart. Hugh M’Pherson. James Campbell. Chaplain—John Ferguson. Adjutant—Samuel Swinton. Quartermaster—James Clark. Surgeon—William Henderson. As the state of affairs in India required that reinforcements should be immediately despatched to that country, all the men who had been embodied previous to January 1788 were ordered for embarkation, without waiting for the fall complement. In consequence of these orders, 400 men, about one-half Highlanders, embarked at Grangemouth, and sailed from Chatham for the East Indies, under the commend of Captain William Wallace. 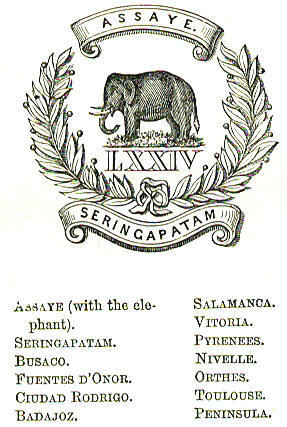 The regiment having been completed in autumn, the recruits followed in February 1789, and arrived at Madras in June in perfect health. They joined the first detachment at the cantonments of Poonamallee, and thus united, the corps amounted to 750 men. These were now trained under Lieutenant-Colonel Maxwell, who had succeeded Lieutenant-Colonel Forbes in the command, and who had acquired some experience in the training of soldiers as captain in Fraser’s Highlanders. The Battle of Assaye 1803. 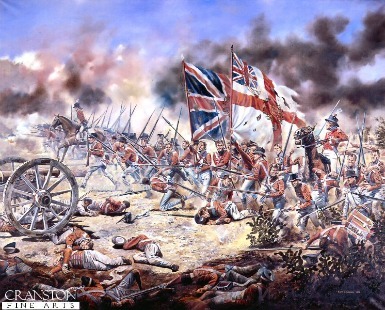 The battle of Assaye was fought on the 23rd of September 1803. On that day Major-General the Hon. Arthur Wellesley attacked the whole combined Mahratta army of Sindiah and the Rajah of Berar, at Asssya, on the banks of the Kaitna river. The Mahratta force, of 40,000 men, was completely defeated by a force of 5000, of which not more than 2000 were Europeans, losing 98 pieces of cannon, 7 standards, and leaving 1200 killed, and about four times that number wounded on the field. The conduct of the 74th in this memorable battle was most gallant and distinguished; but from having been prematurely led against the village of Assaye on the left of the enemy’s line, the regiment was exposed, unsupported, to a most terrible cannonade, and being afterwards charged by cavalry, sustained a tremendous loss. In this action, the keenest ever fought in India, the 74th had Captains D. Aytone, Andrew Dyce, Roderick Macleod, John Maxwell; Lieutenants John Campbell, John Morshead Campbell, Lorn Campbell, James Grant, J. Morris, Robert Neilson, Volunteer Tew, 9 sergeants, and 127 rank and file killed; and Major Samuel Swinton, Captains Norman Moore, Matthew Shawe, John Alexander Main, Robert Macmurdo, J. Longland, Ensign Kearnon, 11 sergeants, 7 drummers, and 270 rank and file wounded. "Every officer present," says Cannon, "with the regiment was either killed or wounded, except Quartermaster James Grant, who, when he saw so many of his friends fall in the battle, resolved to share their fate, and, though a non-combatant, joined the ranks and fought to the termination of the action." Besides expressing his indebtedness to the 74th in his despatch to the Governor-General, Major-General Wellesley added the following to his memorandum on the battle :— "However, by one of those unlucky accidents which frequently happen, the officer commanding the piquets which were upon the right led immediately up to the village of Assays. The 74th regiment, which was on the right of the second line, and was ordered to support the piquets, followed them. There was a large break in our line between these corps and those on our left. They were exposed to a most terrible cannonade from Assaye, and were charged by the cavalry belonging to the Campoos; consequently in the piquets and the 74th regiment we sustained the greatest part of our loss. "Another bad consequence resulting from this mistake was the necessity of introducing the cavalry into the action at too early a period. I had ordered it to watch the motions of the enemy’s cavalry hanging upon our right, and luckily it charged in time to save the remains of the 74th and the piquets." The names especially of Lieutenants-Colonel Harness and Wallace were mentioned with high approbation both by Wellesley and the Governor-General. The Governor-General ordered that special honorary colours be presented to the 74th and 78th, who were the only European infantry employed "on that glorious occasion," with a device suited to commemorate the signal and splendid victory. The device on the special colour awarded to the 74th appears at the head of this account. The 78th for some reason ceased to make use of its third colour after it left India, so that the 74th is now probably the only regiment in the British army that possesses such a colour, an honour of which it may well be proud. Captain A. B. Campbell of the 74th, who had on a former occasion lost an arm, and had afterwards had the remaining one broken at the wrist by a fall in hunting, was seen in the thickest of the action with his bridle in his teeth, and a sword in his mutilated hand, dealing destruction around him. He came off unhurt, though one of the enemy in the charge very nearly transfixed him with a bayonet, which actually pierced his saddle. 1803 - 1804 - Ahmednugger, Argaum, Assaye, Deccan, Holkar's, Chandore and Jaulnah - at Assaye, every officer present, save one, was killed or wounded, and the battalion was reduced to a mere wreck. Awarded a Third Colour in recognition of their conduct at the Battle of Assaye. 1810-14 - 71st and 74th in the Peninsula War. Fought at Busaco, Fuentes D'Onor, Almaraz, Badajoz, Ciudad Rodrigo, Salamanca, Vittoria, Arinez, Pyrenees, Nive, Nivelle, Orthes, Toulouse.